By now you've probably heard of Pinterest. If not, it's only a matter of time. In a mere two months or so, the social network has gone from little-known beta startup to hottest social network since Facebook. So what the heck is Pinterest, and how do you use it? I've got a quick tutorial to show you the ropes. 1. Pinterest is essentially a Web-based bulletin board (think: cork, thumbtacks, and photos) where people share images of stuff they like (think: Facebook without all the drivel). 2. At the moment, it's still an invitation-only site. You can click Request an invite and submit your e-mail address, or ask someone who's already signed up to send you an invitation (which they can do by mousing over their username and clicking Invite Friends from the drop-down menu). 3. Even without signing up, you can browse "pins" that others have posted. 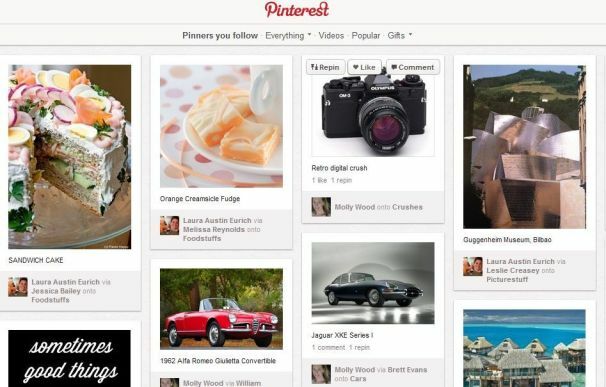 By default, Pinterest shows a little of everything: food, fashion, products, sports, travel, and so on. But you can easily focus the content by choosing a category. 4. A pin is little more than a photo with one or more comments, plus a link to the site where it originated. 5. Once you have an account of your own, you can pin items using various methods. The easiest: upload a photo from your PC, or use the Pinterest "Pin It" button (which is essentially a bookmarklet) to pin from whatever site you're viewing. 6. In addition to pinning miscellaneous items using Pinterest's available categories, you can create your own "pin boards": collections of pins based on any topic you want. Needless to say, Pinterest is a very social service, offering integration with Facebook and Twitter and matching you up with friends so you can see what they're pinning (and vice-versa). I've heard Pinterest described as "Facebook for women," and I'll admit a lot of the categories and images skew that way. But there's plenty of interesting stuff for all to see, and I'm sure as the service grows, the content will start to balance out.